RAPID RIVER LODGE SLEEPS: 18-22 BEDROOMS: 5 BATHROOMS: 4 RIVERFRONT (Rapid River--adjacent to small waterfalls) *NEW (2019) LUXURY HOT TUB *HANDICAP ACCESSIBLE *HUNTING/SNOWMOBILING ON PROPERTY *GREAT FOR EXTENDED FAMILY TO BRING RVs OR CAMPERS *GREAT FOR RETREATS, BUSINESS MEETINGS, SCOUTING, FAMILY REUNIONS & VERY SMALL WEDDINGS (60 people or less) Located on 40 private acres within the Hiawatha National Forest. Connect with nature, relax, and have fun at this historic lodge, known to locals as the Old Dutch Mill. All under one roof, yet your own personal space. With the open floor plan, there is plenty of space to meet your group's needs. Still, if you are just looking for a large hall and will need to move the furniture out of the great room, then perhaps a standard hall would be your best bet. The Rapid River Lodge is fabulous place for 18-20 people. A family vacation, group of friends, corporate event, a retreat, anniversary celebration, a place for your out-of-town wedding guests, a place for your bridal party or a VERY small wedding or family reunion (60 people or less) is wonderful. The space is ideal to rejuvenate and reconnect. Enjoying the hot tub along the river while listening to the soothing water falls is extremely peaceful. This is a comfortable place where 18 people can gather around a single hand-crafted table or spread out in small groups around 6+ small gathering areas. Children have plenty of room to play. Listen to the Rapid River Falls along the 80' deck. Rustic Decor. High ceilings. Large, open kitchen, plus 2 bar and deck areas. A gorgeous natural wood-burning field stone fireplace warms the sitting area. 1 wood-burning stove. TV/DVD/VCR. Simple bumper pool table, air hockey. Master bedroom overlooks the Rapid River and has a private deck entrance. Large outdoor fire pit along 1/4 mile of secluded river front. FREQUENTLY ASKED QUESTIONS GENERAL RAPID RIVER LODGE FAQs Business retreats/events: We do have a pull-down screen hidden in one of the beams in the living room (former dance hall). Also, we do have a projector available, which you can use to project images from your computer. Just ask and we'll make sure it is available to you upon arrival. Cell phone service: Generally, cell phone service stinks at the Lodge. In our experience, Verizon is the best at the Lodge. AT&T is nonexistent. Sprint used to be nonexistent as well, though I have heard it has improved. Hence, we provide a free land line phone with unlimited local and long distance service during your stay. Future Dates: We will start working on 2020 reservations in September 2019. Guests who have currently reserved the weeks have priority. We try out best to accommodate everyone to the best of our ability. You are welcome to let us know the dates you are interested in, and we'll put you on the list. Thanks for your patience as we work through the many variables. We thank you for your business. Grocery Stores: The closest convenience store is just 7 miles south of the Lodge, in the gas station on the corner of US 41 and US 2. The closest full-service grocery store is in Escanaba, about 20 minutes southwest of the Lodge. (Elmers, Wal-Mart, Save-A-Lot). The closest Whole Foods-type grocery store is 40 miles North of the Lodge in Marquette. It's called the Marquette Food Co-Op. It's tiny in comparison to a big city Whole Foods, so don't be surprised. Still, you should be able to get the basic, natural foods you'd need. Pets: *Pets are welcome! Freshwater Vacation Rentals currently charges $50/per pet. Still, the Lodge is not an ideal place for dogs. We do not have a fenced yard at the Lodge. There is a road in front of the Lodge (S15 Road) where I've witnessed drivers driving faster than is safe. It is important to me that your pets are safe. Plus, there is a park next to the Lodge. Our dog used to love to meander over to the park as well. It wasn't a relaxing place for me with a pet. Therefore, I can not recommend dogs at the Lodge. Local Public Pool: Gladstone (about a 15 minute drive- $6/person) Upper Peninsula Attractions Pictured Rocks National Lakeshore: is 60.6 miles away and about 1 hour and 22 minutes. Tahquamenon Falls State Park: is 127 miles away and about 2 hours and 17 minutes. Mackinac Bridge: is 140 miles away and about 2 hours and 32 minutes. *************************************************************************************************************** Weddings: 60 people is the maximum we can allow for a nice experience for everyone. Due to past challenges, we can no longer offer exceptions to this number of people. If the number exceeds 60 people, you will have broken the rental agreement and you will need to leave the property immediately. The Lodge is NOT an empty hall. Therefore, there is furniture and other pieces which made it comfortable for family gatherings. Yes, back in the day, the Old Dutch Mill was a dance hall similar to VFW halls today. I love the history that the Old Dutch Mill/Rapid River Lodge expresses. Still, with the addition of the 5 bedrooms and 4 bathrooms, it is impossible to offer the same hall experience. It's equivalent to pushing a square peg into a round hole. INSIDE THE LODGE FAQs Air Conditioning: The air-conditioning at the Lodge contains 2 window units in 2 of the bedrooms. There is NOT central air-conditioning at the Rapid River Lodge. We do have additional box fans, as well as the 9 ceiling fans for your use. Beds/Bedrooms/ Sleeping Arrangements: We have 13 beds at the Lodge, and sleep 18-20 people comfortably. There are 5 bedrooms and 4 bathrooms. A simple bedroom layout graphic is available. Just ask. Simple linens are provided with each bed: pillow with pillow case, mattress pad, bottom/fitted sheet, top sheet and a blanket and/or comforter. Additional linens and blankets may be found throughout the Lodge. Bedroom 1: 1 Queen (where a window air conditioning units is housed in the summer) Bedroom 2: 1 Full + 2 Twins (bunks) Bedroom 3: 1 Full + 5 Twins (3 sets of bunks + 1 twin pull-out trundle) (where a window air conditioning unit is installed in the summer Bedroom 4: King + 1 Full (Partial riverside view with the only bedroom TV at the moment) Bedroom 5: 1 Queen + 1 Full (Full riverside view) + 1 daybed w trundle There is a full-sized pull-out couch. Daily Housekeeping Service: We can provide daily housekeeping service (making beds, doing the dishes, basic bathroom wipe-down and floor sweep) for an additional fee of $50-60/day, depending on the distinct needs of your group. Internet: YES, we have added Internet to the Lodge. Free WI-FI. Yippee! It is wonderful. As good of service as I have here at home. Go Wild Blue! Plus, recently added a 2nd service to cover the back bedrooms. Lights: We are working diligently to update and improve the overhead lights in the dining and kitchen areas at the Lodge. Therefore, we have extra mobile lighting if you need more direct lights during your stay. TV/Cable + DVD/VCR players: Yes, we have basic Dish Network (satellite) with both local and cable channels. We have a large 55" TV in the living room, with a standard DVD player only. Bring your Netflix account info to sign in. If you don't have Netflix, feel free to call our office from the Lodge phone and we can give you ours Netflix account info. Also, there is a small 20" TV with satellite cable in the king-sized bedroom. There is an old-school furniture-style floor TV in the room with a double bed and twin bunks, yet that only functions with the VCR and DVD player. We gave an assortment of VHS tapes and DVDs for your enjoyment. KITCHEN: Coffee Pot: We have a restaurant-style Bunn Coffee maker at the lodge with multiple carafes for your coffee. We have at least 1 additional standard coffee pot as well. Dishes/Silverware/Cooking/Baking/Glasses: The Lodge is fully equipped for all of your basic needs, and most of your other cooking needs as well. The kitchen prep area is so large that at times it is difficult to find everything. We generally have dishwasher detergent and dish soap for your use. Still, if your family is large and you use all the provided dish soap and need more, the best place to find soap is in Escanaba, about 20 minutes west of the Lodge. Refrigerators: Yes, we have 2 refrigerators at the Lodge. One is a freezer-less refrigerator, and the other is a standard refrigerator. We do NOT have additional coolers at the Lodge. Please bring your own coolers. Roaster: We have an electric roaster for your use at the Lodge. Stove/Oven: We have a standard stove-top with 2 ovens below. One is smaller, more of a pizza-size. The other is standard. Tables: The beautiful large wooden table seats 18 people with the padded, wooden chairs. We also have the following extras (the exact number may fluctuate a bit) Banquet/Sewing/Scrapbooking Tables 17- 8' x30", 1 table 6'x 36", Standard table height 36" **************************************************************************************************************** OUTSIDE THE LODGE FAQs Boat Rentals: For use on Lake Michigan (not directly on Rapid River, as the river fluctuates between 6 inches and 4 feet) the closest place to rent a boat is Richards Boat Rentals. They rent pontoon boats and fishing boats for use on the Big Bay de Noc. 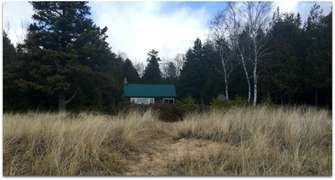 E4528 State Hwy M-35 - Escanaba, MI 49829 (about 20-25 minutes from the Rapid River Lodge) Fire Pit: Yes, we have a large fire pit, with the beautiful view of the Rapid River. You can find plenty of fallen wood throughout the private 40 acres. You can also ask us to bring a truck bed of wood (face chord) for specifically your bonfires ($80 additional for a 18"x4'x8" face chord) Fireworks: Please check the fire danger status before you consider using legal fireworks at the Rapid River Lodge. Only legal fireworks are allowed. You are surrounded by a forest. It is your responsibility to be safe. Please be especially cautious around children. Please dispose of all wrappers, sticks, etc. Lawn Chairs: How many? 4 rocking chairs on deck; 4 wooden chairs around fire pit. A few additional lawn chairs on the porches. Probably best to bring your own lawn chairs. Projector: We have a simple projector you can use with a compatible lap top to show presentations or slide shows during your business retreat. tiny wedding, or just your fun family vacation pictures. We keep this in the back room, so please let us know if you need it left out for you and your family. River: The Rapid River is directly in front of the Lodge. It does have a current. Normally, it is about 1 foot deep. Over the past 7 years of owning the Lodge, it has been as low as 6 inches and as high as 3 feet. Awesome place!-Lodge was perfect! Plenty of space, beds, essential toiletries, kitchen/cooking supplies so much more than we were expecting. The hot tub was awesome, river view was beautiful, plenty of deck space, gas fireplace was cozy. Great place to gather with family and/or friends! Perfect for Business too-Bi-Annually my team o0f managers that work in both MI and WI meet mid way to align and have our meetings for the year. We have found a gem of a location offering both plenty of area to work collectively, or to break into teams to work on projects. The staff and management of the location is always very helpful and engaged on offering a level of service expected and even exceeded. Bring your family, your business, or just yourself. Wonderful stay, wonderful place. Michael, thank you for this wonderful review. We are thrilled that Rapid River Lodge worked out so well for you and your business associates. The Lodge is perfect for large groups: the huge table for eating or work space, open living spaces and the fabulous stone fireplace make for a comfortable, lovely getaway place. We hope to see you again soon. Description didnt give it justice. This place is amazing, and HUGE. The river is an added bonus-This place is huge. The rooms are well laid out, and have plenty of space. the blankets looked a little aged so we started off by washing the bedding that was on the beds, but I usually do this. There was enough room for us all to do out own thing in the cabin, and not bother anybody else, but when food was ready we had enough room to comfortably eat. The hot tub being broken was a bummer. We really looked forward to using it. Nothing else was below my expectations besides aged blankets and a broken hot tub. I didn't get to explore the whole 40 acres but I'm sure it was beautiful. Jack, thank you for this review. We especially love it when our guests enjoy our properties as much as we do. Rapid River Lodge is a very special place, and perfect for large groups. Its location on 40 private acres within the Hiawatha National Forest adds to its allure, plus the huge stone fireplace, in winter especially, adds to the already fabulous ambiance. Please accept our apologies for the hot tub not working - it is now back in full working order. Also, just for your information for future rentals with us, we always make certain that the bedding has been cleaned, so there is no need to rewash everything. We really hope to see you back again! Room with a view!-Accommodated our 24 person Company Christmas Party with no problems. More than enough room for large gatherings. Hearing the river from the deck is amazing. Quiet area, lodge life feel, reasonable pricing...Cant beat it. Adam, it sounds like Rapid River Lodge was the perfect place for your large group! What a smart idea to hold your office Christmas party there. That amazing stone fireplace would certainly add great ambiance for your festivities, plus the open concept rooms makes for a great flow for large groups. We hope to see you all again in 2019! We enjoyed our stay-We would like to make this a annual stay. Everything was excellent. Al, we are so glad that you enjoyed staying at Rapid River Lodge. The fact that it is large, handicap accessible, that pets are allowed, that you can ski and snowmobile right on the property and that it has a hot tube makes it a pretty fabulous place to stay. We hope to see you again! We love the lodge and everyone has lots of room for all of our ceremony activities. Thank you for allowing us to continue our traditions and use the lodge. I promote the lodge whenever possible to others. Suzi & Bill, we are thrilled that you continue coming back to Rapid River Lodge. That is the best review we could ever get. We appreciate the word of mouth recommendations for the lodge also, and look forward to your visit in 2019. With out being there you won't know how beautiful this place is.Used for our hunting camp and everyone loves it here.The lodge has so much room for our group we never feel crowded and when you hit the bed the river rocks you to sleep.We'll be back for many of years to come.Thanks to everyone for making out stay so enjoyable. Bob, what a delightful review - thank you for that! Rapid River Lodge is the great place for a large group, and it's perfect for hunters. The stone fireplace warms you up quickly after a day of hunting, and like you said, the river rocks you to sleep. Perfect. We'll keep space open on our 2019 calendar for you! Always a great place to stay ! Cheryl, we love having you back! Rapid River Lodge is such a great place to go to in the fall, with the changing colors and that great stone fireplace to warm up in front of! We'll look for you again next year. The best memories made!-We went to the lodge under previous ownership many years ago, and decided we wanted to go back and show it to the next generation. They were wonderful to work with, and so accommodating for our large family! We had 27 people, and we were able to get everyone a bed. Large space for big families and lots of space for little people to roam around without hurting anything. Had almost everything you would need in the kitchen, and made some wonderful updates with more fridge space, a hot tub, nice grill, and so much more. Many more wonderful memories made, and we will definitely include coming back here in future vacation plans! Sarah, nothing makes us happier than hearing that Rapid River Lodge worked out so well for your large group. The magnificent fireplace, the hot tub, and the surrounding land make it a very special place to stay. We love being a part of making family memories, and we hope you come back soon. Expect more than the pictures can convey. Beautiful area, spacious. . So much room to prepare meals and visit. You are able to have quiet time or more private time when you want, without ever really leaving the others. The place has a good feeling about it. Great place to create memories. Probably our favorite vacation rental ever. A real special place. Becky, thanks for this review! Rapid River Lodge is a great property, so it feels good when guests enjoy it as much as you did. We hope to see you back again! Refreshing get away-We had an amazing weekend with our ladies group. We enjoyed the beauty of the the cabin and outdoors. It so spacious. Loved every moment! It was a great experience and we hope to do it again. Monica, we are thrilled that you and your friends enjoyed Rapid River Lodge as much as we do. It is a truly spectacular place for large groups especially. We'll look for you again in the near future! Fabulous time-We had a fabulous time at Rapid River Lodge. There were games there to play, although we found that the bingo game had several numbers missing so we used ours we brought with. The river was a source of never ending entertainment--floating over the small rapids with inner tubes, catching and releasing millions of crawfish, and just plain sitting in the river to relax. The lodge was equipped with anything for cooking that you would ever need but wish we would have known that there was a cast iron griddle before we brought ours from home. Loved the ice cream place just back up the road--nice prices. We would highly recommend it to anyone wanting a peaceful stay. Thanks again for working with us! Gwen, your enthusiasm is addictive! We are thrilled that you had such a good time. The river is quite the special place, especially on a hot summer day. Thanks for the ice cream recommendation also - we just may have to try it ourselves. beautiful an huge interior-We loved the lodge, and the river. The grandchildren waded in the creek every day. Crawdad heaven. They were everywhere. we would rent again in a heartbeat. Next year the state is opening a large campsite complete with off road trails. That will be interesting in 5-10 years when our grands can enjoy them. Crawdad heaven - I love it! Perhaps we need to rename the property. The image of your grandkids wading in the creek is priceless. Interesting about the state campground. We'll look for you again soon. Excellent service from caring people, especially the owners!-We loved the Lodge! Our 10 grandchildren played in the huge open space inside every day. We caught so many crayfish we lost count on first day. Water was safe for our 16 month grandson to walk alone, but we held his hand to keep him from drinking the water, LOL! Absolutely worth the expense. Bruce, I love the image of you walking in the water with your 16 month old grandson! Precious. Catching crayfish is such an adventure, and I'm certain brought much excitement to your 10 grandkids. You all are making wonderful family memories, that's for sure, and we are honored to be a part of that. Froberg Family Reunion-Had a wonderful time at the lodge it was a great place for this event a relaxing atmosphere for visiting and meeting new relatives. Only suggestion is fixing sliding glass doors very hard to open especially for the very young young and very old. Hi Sheri, Thanks for the note about the sliding glass doors - we'll get that fixed. We are happy that you enjoyed the Lodge. We think it's a pretty special place also. Come back again soon! WOW this place was more than we expected. The place was huge, had everything you could need for the kitchen, and even had games for everyone. Every game we brought up, they had there. We left a croquet set as our kids did not want to play it. The river was a good source of entertainment for everyone--floating down the rapids in tubs, catching and releasing crawfish, and sitting in the river for the adults. A suggestion is for some lounge chairs. The bingo game is missing many pieces so we used our own. The hot tub was the best we have had in various locations. The nearby playground was nice also. We LOVED our stay and thanks for sharing your lodge with us!!! Bob, we certainly appreciate your enthusiastic review of Rapid River Lodge. We love this property, and would be more than happy to share it with you again anytime! Thanks for the suggestion of lounge chairs - we'll pass that on to the owners. We had a wonderful time!-Thank you for another wonderful stay at your lodge. You are always so very helpful and accommodating. I really appreciate all you offer and do to make our stay great! Thank you!! We are so glad that you enjoyed your stay at the Rapid River Lodge. It's a really sweet property. Also thanks for the kudos on our communication. We make every attempt to achieve excellence in our guest relationships, so is always good to get feedback on our successes! We hope that you will come back again, and know that we give a 10% returning guest discount when you book directly through us. U.P. Stay-Very clean. They come out to take care of any problems fast. We got snowed in and we were plowed out fast. Everything was there that we needed. We had lots of room. The only reason I gave it a 4-star is because the Hot tub could use more care in cleaning. I would stay here again. We loved it. We are so glad that you enjoyed your stay. Also, thank you for the info on the hot tub. We will take care of that. We have over 70 properties for you to choose from, and we give a 10% returning guest discount when you book directly through us. We hope to see you again soon. Quilt Camp!-Twelve of us enjoyed a fabulous time at the Rapid River Lodge! The Lodge is the perfect setting for a quilt retreat. Cozy, yet spacious. The lighting was great. Tables, extra lights, extension cords and power bars were all provided. We are so glad that you all enjoyed your stay for your quilting retreat. Rapid River Lodge is a great property. We hope to see you again soon. Loved it-Our group honestly loved everything about the lodge. We would love to come back. We would recommend and return. Thank you! We are so happy that you enjoyed your stay at Rapid River Lodge. It is a great property. We have over 70 properties for you to choose from, and we give a 10% returning guest discount when you book directly through us. We hope to see you again soon. Everything was great. New lighting was great for quilting. Thank you. Hi Rose, So happy to hear that you enjoyed your stay and that the light was good for quilting. When you have a chance, check out all of our 72 properties. We give returning guests a 10% discount when they book directly through us. We look forward to working with you in the future! As usual everything was very neat and clean. I feel comfortable to say we left the lodge the same . Thank-you for letting us enjoy our night for fellowship. Bill G.
We are so glad we can accommodate your group here at the Rapid River Lodge. We look forward to your visit next year! Spectacular lodge!-The Rapid River Lodge is the perfect place to hold a meeting! Our recent board retreat was held there, and everyone loved the lodge. The natural beauty of the location is apparent as you drive up: the river flows past the lawn, and deer were running across the park next door as if one cue. Inside, the lodge is spacious and gorgeous. It could easily accommodate 25 or more participants. It would also be perfect for large family gatherings, as it could sleep 15-20 people with ease. The staff at Fresh Water Vacation Rentals was so nice, and so helpful. A treat to experience that level of customer service! We are so glad we held our board retreat at the Rapid River Lodge. We'll hold our next one there as well! Great Place for quilting!-We greatly appreciate the cleanliness, improvements, the location and we are looking forward to the lighting improvements, Rose, Bay de Noc Quilters. We are happy the group enjoyed their stay! We appreciate your positive comments. Let there be Light (more soon)! See you soon! WONDERFUL!-We had a wonderful stay at the Rapid River Lodge. The weather was wonderful, we watched a wedding, and the Lodge its self was gorgeous. We were very amazed at all the supplies that were available to us to use. This is a very beautiful place and hoping to return in 5 years to enjoy this beautiful Lodge. 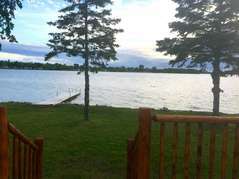 Freshwater Vacation Rentals is very accommodating and very easy to make vacation arrangements. Thank you. We look forward to seeing you in a few years! Amazing-â˜… â˜… â˜… â˜… â˜… My family used to own the lodge and even though it was different, the where still many things that stayed the same. It was great to be there again. We actually got married there. It was wonderful. We are thrilled you enjoyed your stay! Thank you for returning to Freshwater and the lodge. So cool to host the previous owners! Again in a Heartbeat-The lodge was great we loved it. The only suggestion i can make is the repair of all the sliding doors and several ceiling fans to improve the air flow in the cabin. All in all i would do it again in a heart beat. Thank you for the suggestions. We are thrilled you enjoyed your stay. Perfect Place for Prom!-We have a small school, so this location was absolutely perfect for our Junior/Senior prom. We had around 60 kids there, and it looked amazing. The deck overlooking the river only added to the beauty, and all of the kids said it was fabulous. Rapid River Lodge-We rented the Rapid River Lodge Feb. 18 and 18, 2017 and had a great family vacation there. At our kids suggestion, we skipped the Christmas presents and instead spent our money on memories. It was a great suggestion and we plan to do it again. The lodge was large enough for our group of 10 adults and 9 children. We loved the large dining table, the well equipped kitchen and the multitude of bedrooms and bathrooms. We lucked out and enjoyed 50 degree weather on the deck overlooking the burbling river. Kids and adults both enjoyed the outdoor hot tub. The staff was very accommodating, from allowing us early check in, late check out and mailing us items the kids left behind. We look forward to more family memories to be made here. Fantastic, as aways!-First, we enjoy our stay each time we come. NOt only is it clean but we have plenty of room and great internet. This time, myself and fellow scrapboookers were very excited to find lights (12 of them!) for our scrap tables, extention cords, and cord chancellors. The electric multi outlet strips were also a surprise!!!!! WE appreciate you taking such good care of us! See you in March! Exceeded expectations-I cannot say good enough things about this place. After a long drive from Ohio we so badly wanted to relax in a getaway for a few days. We were refreshed more than we thought possible. The lodge is beautiful, and the surroundings are the same. This place was perfect for our family of 13. No complaints, and we can't wait to make another booking! Beautiful & Relaxing-This was our second stay at the lodge, first was 6 years ago. Our daughter& son-in-law, their neighbors and her parents decided to to vacation at the lodge so we went along. Everybody was able to return this year including 2 more children. Such a peaceful and relaxing place! Weather was awesome and everyone enjoyed the whole experience. Will come again, may make this a yearly experience! We hated leaving yesterday!!!! !